We are so grateful for our brides! You are our family! give us all of the forest princess boho vibes! patricia got married at the twickenham house, just outside of asheville nc. talk about the sweetest babe in the world! julia, thank you for allowing us to be part of your day! thank you sweet christine! you and your hubby are goals! both bride and groom wore “red bottom” christian louboutins on the wedding day. could we love you more? Bethany, we had so much fun with you and your family! congratulations on such a beautiful wedding and amazing marriage! 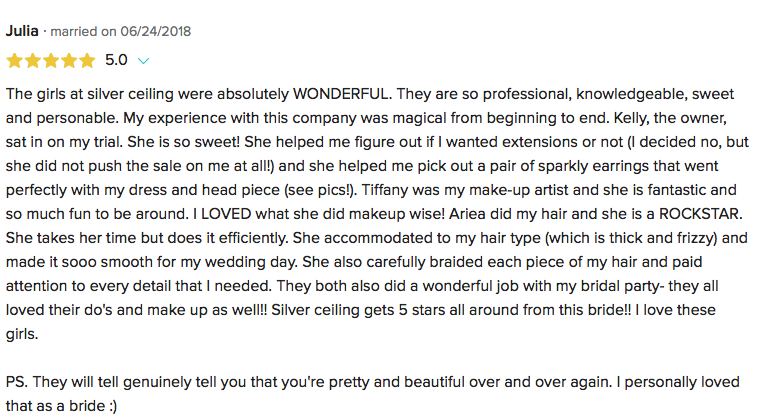 Deciding to go with Silverceiling was one of the best decision I have made for my wedding! I started off very hesitant as I am not a big make up person, but ‘my oh my’ did I enter a whole new beautiful world!! I had a make up trial two weeks ago and I have never felt that confident about myself in my entire life! I have had a severe skin disorder (Eczema) my whole life and was worried I would have a bad reaction, or it would look cakey, or wouldn’t stay on my skin, and none of these things happened!! I had engagement photos after my make up trial and every body thought it looked so amazing (including myself and my fiancé!) I asked for eyes that popped and a smooth natural look everywhere else, and it was exactly as I wanted! When I was having my make up done Jonny (sweetest person ever) , I saw Maria (so fun and sassy!) working on another bride’s hair. After sitting and thinking about how jaw-dropped I was by the hair I had seen, I asked for a hair trial the next week and it was amazing!! I am so excited to get married as I know that my hair and my make up will be ON POINT! It was something I never knew I really wanted, but I felt like a gorgeous movie star and felt so confident about the way I looked. Who wouldn’t want to feel that way on their wedding day? !